You'll sometimes hear this notion of being "square" to the skis. What it means is that the hips and shoulders follow the boots/skis and are on top, without any separation. This is in direct opposition to the notions of separation, counteraction, countering, coiling etc. There are several schools of thought that advertise stying square to the skis in medium/long turns, this goes contrary to The wall and Coiling. Although square and stacked are different, the video below shows also a rather "square" approach. "Square" is a similar issue as using a wide stance. It will perhaps feel more "stable" at low speeds and relaxed skiing, when weighting both skis, but will become a hindrance when we actually weight just one ski, which is what we want even on the green slopes. When we are committed to the outside ski, if the inside ski is far apart, it will just make it harder to edge the skis and balance. Rotating with the skis through the turn and staying square to the skis also reduces balance. 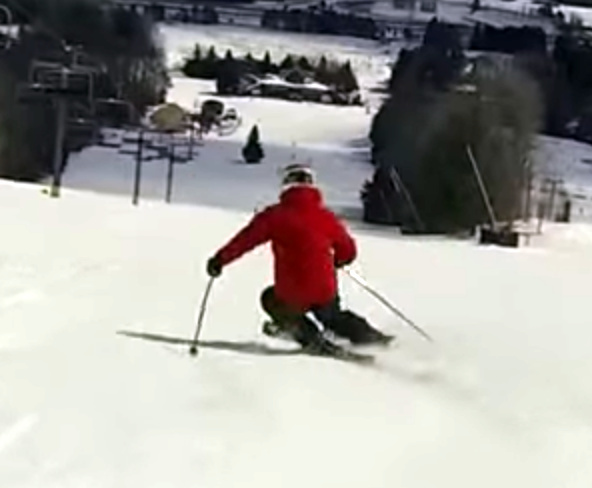 As you can see in the racer's photo above, the biggest range of motion exists when we counteract the skis through the turn and we need range of movement, to maintain balance. See Braquage, Separation, counteraction, countering, Coiling. Viewed 301 times ( | Print ) this page.